The scientists call this batch of dark matter the S1 stream. However, they can't actually "see" it: they've supposed that it exists because of about 30,000 identified stars with a different chemical composition than those native to the Milky Way galaxy. Those stars are moving in a similar elliptical path, which heavily suggests they're remnants from a dwarf galaxy that long ago collided with the Milky Way galaxy. Since the S1 stellar stream's path goes through the solar system, the dark matter hurricane provides a better chance for different detectors scattered across the globe to pick up traces of these hypothetical particles, CNet reported. Scientists at University of Zaragoza, King's College London and the Institute of Astronomy in the UK made the discovery, the results of which were published in the journal Physical Review D on November 7. "[There are] tons of these streams all over the galaxy, some of them are really huge and you can see them in the sky," Ciaran O'Hare of the University of Zaragoza and one of the study's authors told Astronomy, noting that they believe these streams include large amounts of dark matter. They identified the stars using the European Space Agency's Gaia spacecraft, a satellite launched in 2013 to construct the largest space catalog ever made, the New York Times noted. In May, scientists working with Gaia released a "map of the Milky Way," tracking some 1.3 billion stars and interstellar objects with unprecedented precision — but still only about 1 percent of the whole galaxy. The existence of dark matter isn't something directly observed as of yet, NASA notes, but rather extrapolated from necessities in observed behavior by "regular" matter in the universe. "The expansion of the universe has not been slowing due to gravity, as everyone thought, it has been accelerating," according to NASA, meaning that either Albert Einstein's theory of gravity is wrong or there's something else, another form of matter or energy that's unseen but acting on the matter we can see. That big question mark in physics is referred to as dark matter/energy. "It turns out that roughly 68 percent of the universe is dark energy. 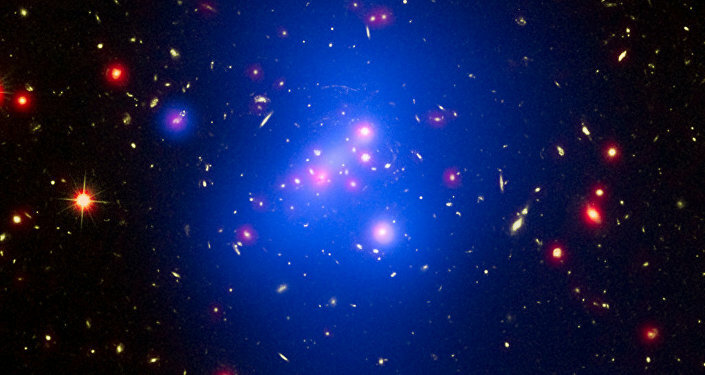 Dark matter makes up about 27 percent," the space agency notes. "The rest — everything on Earth, everything ever observed with all of our instruments, all normal matter — adds up to less than 5 percent of the universe." The dark matter, if it's there, should be flying past Earth at around 143 miles per second, the authors note. But don't fret, it's not leaving anytime soon. We should have at least a million years to study this "dark matter hurricane" before it moves on.